Auckland is the city with everything; move there and you might never want to leave. Sandwiched between the Pacific Ocean and the Tasman Sea, the city offers one of the world’s most intoxicating blends of modern urban lifestyle and gorgeous natural beauty. It’s almost silly how much stuff there is in Auckland. Get ready for this: it has not one, not two, but three harbours, nearly fifty volcanic cones, over fifty nearby islands, almost 30,000 km of coastline and the tallest free-standing structure in the whole southern hemisphere. The place is known as the ‘City of Sails’ for its tremendous number of yachts (about 135,000), but the list of possible nicknames is huge. The Māori name for Auckland is “Tāmaki Makaurau”, meaning ‘the maiden desired by one hundred lovers’. Auckland has a few more than one hundred lovers now, with almost one third of the New Zealand population currently living there. Read on to learn why the city is an expat favourite. As with every New Zealand city, Maori got there first. They settled in the Auckland area in 1350 and it wasn’t until nearly five hundred years later that they sold the land to British settlers. Auckland was actually New Zealand’s capital city for over twenty years in the 19th century before it lost the crown to Wellington. However, its lack of capital status since then hasn’t been a problem, and the city has now become New Zealand’s most important economic powerhouse (as well as a truly lovely place to live). Auckland’s geography is extremely unique. The majority of the city lies on a narrow strip of land (called an ‘isthmus’) which measures only two kilometres wide at its narrowest point. 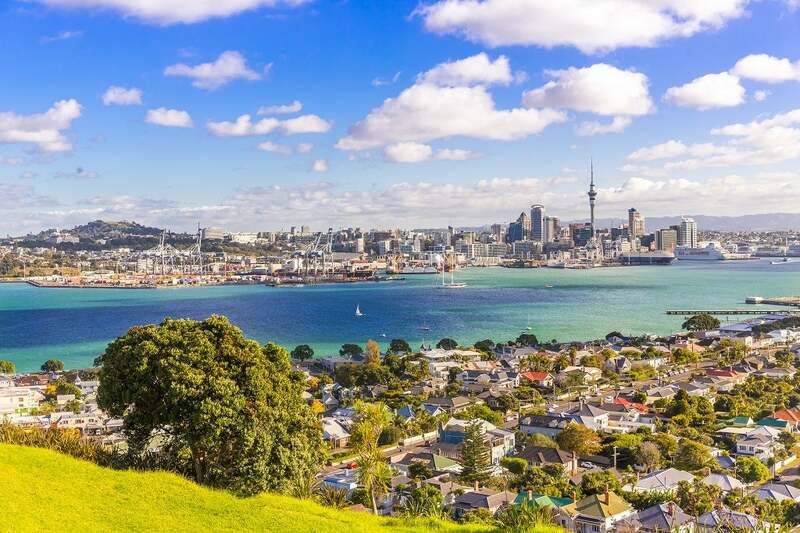 With the sea on both sides and beautiful islands only a short ferry ride away, life in Auckland is probably one of the world’s least city-like experiences. If the ocean doesn’t float your boat then there are also two nearby mountain ranges and loads of forests to hike through. The city also lies on a volcanic field, which is why there are some pretty spectacular hills and lagoons scattered all over the area. But don’t worry; the city’s volcanoes are all dormant. In short, you can walk in any direction from Auckland’s city centre and sooner or later you’ll find some magnificent piece of nature. Auckland’s temperatures are a lot more moderate than the serious heat you can get in Australia, with the oceans around the city preventing things from getting too hot or too cold. Temperatures generally range between 7-15°C in winter and 14-24°C in summer. If the city wasn’t blessed enough already, it’s also one of the sunniest places in New Zealand, enjoying 2,060 hours of sunshine each year on average. Rain in Auckland is generally pretty heavy but very brief, occuring most frequently in the winter months from June to September. The city’s storms happen so quickly that people often talk about Auckland having ‘four seasons in a day’. A light raincoat that you can put on quickly will prove very handy. Anyway, the rain is just the price Kiwis have to pay for such lush natural scenery. If you’ve ever wondered where the world’s largest urban Polynesian population is, wonder no more! Auckland houses Polynesians galore, along with significant numbers of Maori. Unsurprisingly, the dominant ethnic group is European, comprising 59% of the city’s population, with Asian people in second place at 23%. A little over 1.5 million people live in the city, but the numbers are skyrocketing and it is predicted that, by 2031, Aucklanders will number nearly 2 million. Expats are a big player here, with almost 40% of the city’s population coming from overseas and immigration currently contributing to two thirds of the city’s population growth. Its multiculturalism is something to be reckoned with, ranking behind only Dubai, Brussels and Toronto on the global stage. Despite Australia’s proximity to Auckland, Aussies don’t actually contribute the biggest proportion of overseas people. The top three most common foreign nationalities are British, Chinese and Indian. Who’d have thought it? In terms of languages, English is the most commonly spoken at 96.1%, followed then by Maori (3.7%), Samoan (2.2%), Hindi (1.7%) and Mandarin (1.3%). There are a few practical things worth considering before we get into the fun details of living in Auckland. Fortunately, the visa situation for Aussies in New Zealand is extremely simple. If you are an Australian citizen or hold permanent residency in Australia then you are entitled to live and work in New Zealand indefinitely. Easy! Read more about it here. If you ever need a helping hand from the Australian government for whatever reason, your main port of call in Auckland is the Australian Consulate-General. It is located on Level 7 of the PwC Tower, 186-194 Quay Street, Auckland 1010. Take a look at our table below to get an idea of how much it will cost to move your belongings overseas to Auckland via shipping container. This is only an indication though; prices can vary pretty widely based on how much stuff you’re bringing and where it’s coming from. Source: WorldFreightRates.com. Based on a 20ft container (FCL) of household goods worth USD$55,000. The Auckland lifestyle is probably New Zealand’s finest, which is why the city came third in Mercer’s Global Quality of Life survey in 2017. Here’s a little more detail on what life is like here. Auckland isn’t just big mountains and pretty islands – its economy is something to be reckoned with. The city is New Zealand’s strongest economic power, contributing nearly 40% of the country’s annual GDP and over 34% of its employment. Likewise, the Ports of Auckland handle about 31% of New Zealand’s annual container trade. It’s no overstatement to say that Auckland is probably one of the most overachieving non-capital cities in the world. Loads of big-name companies have set up offices in the northern city, including Microsoft, Vodafone, PwC, Deloitte, Unilever and Mars. The biggest industry is professional and scientific services, occupying 11% of Auckland’s economy, such as accountancy, marketing, healthcare, telecommunication and real estate. Manufacturing is the city’s second largest industry with 10% of its economy. There are some great resources available when it comes to searching for a job in Auckland. Try the websites Workhere and New Kiwis, which are both designed to connect skilled workers from overseas with employers in New Zealand. The New Zealand Herald would be the more traditional route. You can’t be a global supercity without a solid base of great schools and universities. The quality of education in Auckland is excellent and it turns out the people there are pretty clever. About 37% of the city’s adult population have a bachelor’s degree or higher, the show-offs! You can’t move for brilliant high schools in Auckland. Use this website to search through all the schools in the city. There is a handful of world class universities in Auckland, including very old, traditional institutions and cutting-edge technological centres. The city houses New Zealand’s two largest universities. The University of Auckland takes such a simple name because it got there first, opening in 1883 on the site of an old courthouse and jail. Starting with just 95 students, it has since grown into New Zealand’s biggest university and it now caters for over 40,000 students. The university has conducted some whopping investments in recent years, such as the NZD$200 million construction of a new Science tower. In the QS World University rankings, the University of Auckland places 82nd. AUT University is the second biggest university in New Zealand, operating for over 120 years as a technical college but only officially becoming a university in 2000. Like its older brother, AUT also has interesting beginnings, starting in a disused cabinet-making factory with only 137 students. In the Times World University Rankings of 2018, AUT ranks 15th for International Outlook, which is pretty well deserved; the university’s current student cohort share 141 countries between them. The majority of healthcare services in New Zealand are provided for free by the government, so it’s similar to Medicare. One of the great, unique things about New Zealand healthcare is the Accident Compensation Corporation (ACC), which insures every citizen against any kind of accident, even if it’s their fault. The Kiwis generally love the service, paying for their ACC cover via a monthly, compulsory levy on their income (currently NZD$1.21 per NZD$100). New Zealand’s free healthcare services are available to any expat with residency or a work visa that’s valid for a minimum of two years. Fortunately, Aussie citizens can claim permanent New Zealand residency as soon as they touch down on Kiwi soil! There are three District Health Boards that oversee the Auckland region, helping over one million patients every year at seven public hospitals: Auckland DHB, Counties Manukau DHB and Waitemata DHB. With 80% of the region’s population to deal with, Auckland DHB naturally needs big hospitals to do the job. The mighty Auckland City Hospital is the largest hospital in New Zealand, created in 2003 when four separate hospitals were merged together. See the complete list of public hospitals in the Auckland area here. Things aren’t so rosy when it comes to crime in Auckland. Numbeo gives the city a score of ‘48.85’ or ‘moderate’, which is not terrible but not too great either. An investigation in 2016 by Newshub found that three of New Zealand’s five most violent city areas are in Auckland’s CBD. The best practice is simply to exercise caution, such as following local advice and avoiding quiet streets at night time. Living in one of the best cities in the world has a price. According to Numbeo, Auckland’s consumer prices are actually 3.45% lower than Sydney’s, but that isn’t saying much. Take a look at the table below to get an indication of how much things cost in Auckland. The average monthly net salary (after tax) in the City of Sails is AUD$3414.27. With mountain ranges, forests, oceans and islands to explore, it’s no surprise that Auckland’s transport options are so varied and easy to use. Wherever you need to go in Auckland, there’ll probably be a bus service to take you there. The bus system is extensive and super efficient. It also operates with a really funky colour system, so there’s never a dull moment on the Auckland roads. CityLink buses are bright red and they are the best way to get around the city centre, stopping very frequently so there’s no need to worry about times. InnerLink buses travel a bit further out, connecting the inner city to the centre. These ones are bright green and are a little less frequent, coming every 15 minutes. Finally, the OuterLink buses travel between the inner suburbs and the centre, patrolling Auckland in bright amber. If you need to get to the outer suburbs and beyond then you need to use the Metrolink. The Niterider bus is also very handy, operating between 1am and 3:40am on Saturday and Sunday mornings. The trains in Auckland are less multi-coloured but they’re just as extensive and efficient. The central Auckland Train Station is in Britomart on Viaduct Harbour, but there are train stations dotted all around the Auckland region. The trains are electric, meaning they are blissfully quiet, and 500 services run every week. If you like a racket, try the diesel trains to Pukekohe! If you ever want to get yourself to the capital city, Wellington, then the Northern Explorer takes a scenic route all the way down the North Island (and back again). The beautiful nearby islands are extremely popular with Aucklanders and tourists alike, so a good ferry service is crucial for the city. Obviously the ferry is also a very useful way of hopping across from Viaduct Harbour to Waitemata Harbour. The central ferry terminal is a stunning orange building at the end of Queen Street – it’s certainly worth a photo before you get on a ferry. 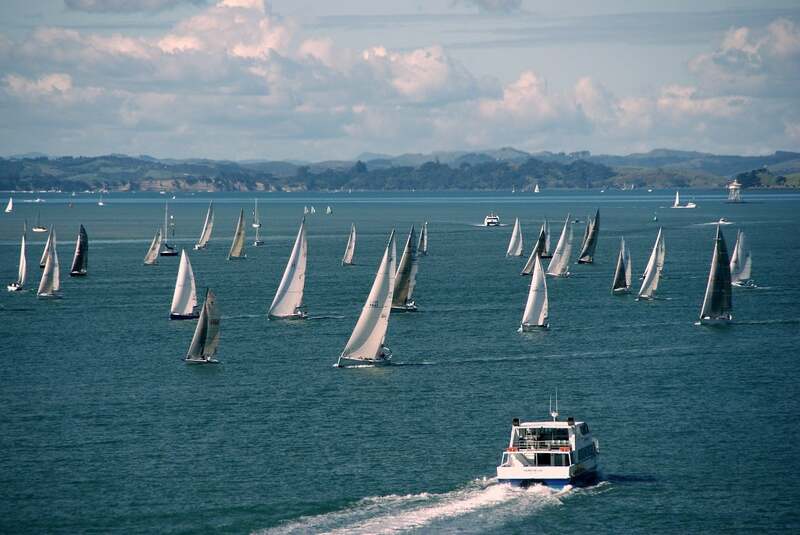 The services can take you all over the place, from Bayswater and Stanley Bay to Devonport, Rangitoto Island and Waiheke Island. The AT HOP Card, also known as the ‘Hop Card’, makes things a lot easier when you’re using public transport in Auckland. You can’t currently pay using a debit or credit card, so the Hop Card is essential unless you want to be fumbling for notes and coins every time. The card costs NZD$10 to purchase, but after that you’ll really feel the benefit. Not only is the cashless travel much quicker, but you get 25% off the price of any single-trip journeys. Auckland is divided into thirteen zones, so the cost of your travel is based on how many zones you pass through. You’re allowed to drive in New Zealand for up to one year if you have a valid driving license from your home country, but after that you need to get with the system and acquire a New Zealand license. According to the TomTom global traffic index, which measures road congestion around the world, Auckland comes 40th on the list of 189 cities (where 1st is the worst, not the best). 40th isn’t too bad for a major city, and there are worse cities in Australasia, such as Sydney at 29th place. There are 220 km of motorways in the Auckland region supporting over 8% of New Zealand’s traffic. There are some pretty exciting stretches of road in Auckland, such as where State Highway 1 crosses the Auckland Harbour Bridge. It’s a fast and scenic way of getting from the CBD to the northern suburbs, such as Takapuna. Most airports in New Zealand are actually too small to handle the larger passenger aircraft, such as the Boeing 747, but Auckland International Airport is an exception. There are two terminals here (International and Domestic) located about 500m apart. You can use public transport to reach the airport, opting for either the SkyBus or the bright orange 380 Airporter bus. The SkyBus runs 24 hours a day on every day of the year. As we’ve already established, Auckland is a brilliant place to live, so you can’t really go too wrong when you’re choosing a neighbourhood. You’re either near the CBD, near the mountains or near the sea. If you’re lucky, you can be near all three. Check out MoveHub’s favourite neighbourhoods in Auckland. The median house price in the city is AUD$778,957, according to the New Zealand Herald. If you want to live in the suburb of a big city without feeling like you’re in the suburb of a big city, choose Parnell. It’s the oldest neighbourhood in Auckland and it feels like an old village. Intermixed with the area’s beautiful houses are quaint cafes, high-end boutiques and a lovely rose garden. You can smell it a mile away! Parnell lies just outside the CBD, so you’re well connected to the centre, but you also get the benefit of genuine peace and quiet. For regular doses of Auckland culture, Parnell residents have the Auckland Museum as well as the La Cigale French market every weekend. Choose a house on the east side of Parnell and you’ve also got the ocean on your doorstep, looking out over Hobson Bay. The median house price here is AUD$1,530,970. This one’s even closer to the CBD, and is similarly bursting with vintage shops, trendy bars and fancy cafes. There is a wonderful mixture of traditional houses and modern homes here, with the neighbourhood’s restored villas representing some of Auckland’s best real estate. On the days you don’t want some of the city centre buzz, take a walk northwards and you’ll reach the sea. Ponsonby’s northern and western sides face onto Waitemata Harbour and Cox’s Bay. However, just a warning: many of the old houses lack proper insulation, so things can get rather chilly in the winter! The median house price is AUD$1,654,708. Although it lacks a coastline, the neighbourhood of Mount Eden has got more than enough natural beauty to make up for it. It takes its name from the dormant volcano that sits right in the centre, which has now become a bizarre, grassy cone offering stunning views across the city. As Auckland’s highest volcano, what more can you expect? You might not be able to get in the sea in Mount Eden but at least you can see it. The district is a little more set back from the CBD than Ponsonby, offering a tranquil blend of leafy houses and artisan bakeries. The median house price is AUD$1,374,003. Sandwiched between mountain ranges and Pacific islands, Auckland’s culture is naturally defined by outdoor activities. Take one glance out of the window on a sunny day in Auckland and you won’t even want to stay inside. Just to give you a flavour of what’s on offer in the City of Sails, we’ve handpicked some of the best things you can do out there. Of course there are several options when it comes to visiting the islands to the northeast of Auckland, but Waiheke Island is arguably the best. Once you’ve taken the ferry there, you can be as lazy or as active as you like. The beaches there are exceptionally beautiful and are just asking to be lain on but, at the same time, the island’s many bike trails aren’t just going to cycle themselves. Guided cycle tours are always available, although the island is so small that getting lost is unlikely. There’s so much more on the Waiheke menu, including kayaking, exploring sea caves, eco-walks and ziplining. The vineyards are also worth a visit, such as the Man O’ War, making some of New Zealand’s best wine and offering some stunning walks to boot! If you want to see Auckland from a slightly different angle, try ascending the massive Sky Tower in the centre of the city. It’s 220m high and the tallest free-standing structure in the southern hemisphere. There are two main activities you can do once you’re up there: walk around it or hurl yourself off it (with ropes attached). The SkyWalk involves tentatively stepping around the ledges of the tower without any handrails. A tour guide will point out various landmarks across the city but you probably won’t feel like looking down. In contrast, the SkyJump is over a bit quicker. As you fall from 95 metres at 85 km per hour, you’ll see the sea, the mountains and the rapidly approaching pavement before a rope yoinks you to safety. No, not the place in the TV show; that’s in North Carolina. 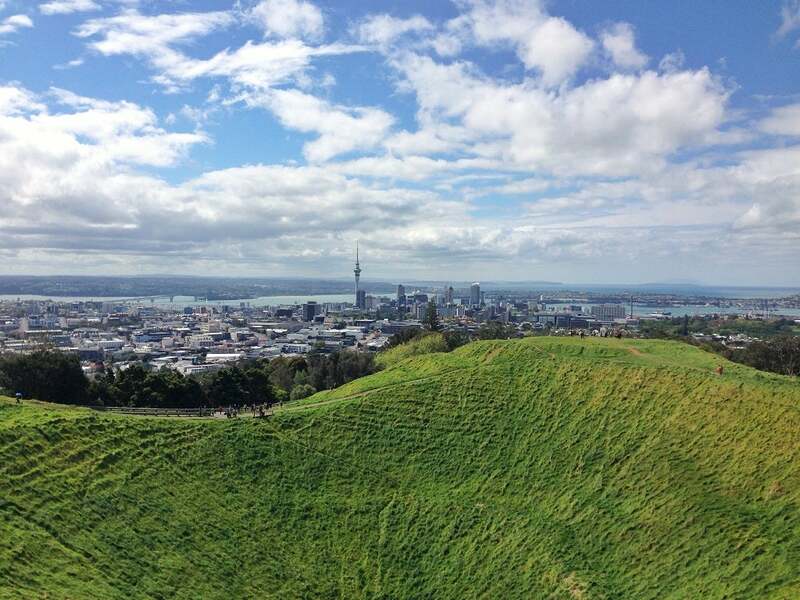 Auckland’s One Tree Hill is a volcanic peak that has been around for some 28,500 years. It offers a fascinating combination of natural and human history, not only documenting some of the phenomenal volcanic activity that has taken place in Auckland but also housing a Maori fort (called a pā). Access to the hill is free and it’s a lovely, tame way of seeing both Auckland harbours without ascending 200 metres. Unfortunately, the single tree that gave the hill its name was chopped down by a white settler in 1852. Auckland is the stage for loads of big events each year. Have a read about some of the biggest! It’s always important to recognise the Maori people’s vast, shaping influence on New Zealand life, and the Tamaki Herenga Waka Festival is a great opportunity to do so. For one weekend every year, a fascinating collection of traditional food stalls and Maori workshops set up along the Auckland waterfront. One quarter of New Zealand’s Maori live in Auckland, so the scale and variety of the festival is staggering. The inaugural festival took place in 2016, but it has been met with extreme warmth and popularity, looking to grow and grow in future years. The Kiwis like a good laugh, and this festival has been entertaining audiences since it began in 1993. Auckland actually shares the stage with Wellington, but both cities get a hearty helping of seriously funny stand-up performances and sketch shows. There’s lots of children’s comedy for the little ones, too! Some big comedians kickstarted their careers at this festival, including Bill Bailey and Simon Pegg. It takes place for one month every year, around April-May time. This one’s a little further out, but it’s well worth the effort to get there. Splore pops up each year on the shores of Tapapakanga Regional Park, which is located about 70 km south east of the Auckland city centre. It lasts for three days and offers a densely packed celebration of music and arts. In such a magical, natural setting, Splore promises a beautifully mellow escape from modern city life. There’s even a ‘Wellness zone’, focused on peaceful relaxation, meditation and yoga. The multitude of activities for kids makes the festival super family-friendly, and the fresh food stalls aren’t too bad either! Auckland’s proximity to the oceans makes seafood an obvious choice here; it’s fresh and top quality, so it should come as no surprise that MoveHub’s favourite food joints in Auckland are all fish-based. Most local restaurants are always doing something inventive with their menu choices, and the multiculturalism of Auckland ensures that dishes from all over the world are available here. If you want to enjoy the views from the Sky Tower without climbing on top of it, perhaps the Sugar Club is your answer. The restaurant franchise has been fusing Asian and European flavours since it first opened in Wellington in 1986. Since then, it has opened three more branches: two in London and now a fourth in Auckland. With breathtaking views of the city out the window and plates of tantalising food on your table, you won’t know where to look. The dining experience is very decadent, with an interior design inspired by 1930s Art Deco Italy. Think stone tables and brass fittings. Some of the dishes on offer include day-boat fish sashimi, seared venison and spiny crayfish with te anau saffron linguine. This place takes itself a bit less seriously than the Sugar Club, as you can probably tell from its name. Fish & Ships serves top quality fish and chips on the seafront, housed in a bright blue shipping container. A chalk board makes the bold claim that their fish and chips are ‘the best in NZ’, but you’ll struggle to argue once you’ve had a mouthful. Fresh fish is cooked to order, so you have to wait about ten minutes, but boy is your patience rewarded. Meals are accompanied with wonderful views of the harbour and there’s a nearby ice cream shack for dessert. In terms of unexpected fusion food combinations, Azabu might win first prize. The restaurant’s executive chef, Yukio Ozeki, combines Peruvian and Japanese flavours, producing stuff like ceviche platters, grilled octopus and spicy pork gyoza with jalapenos. On top of that, there’s also a sake and cocktail bar within the restaurant called Roji. While the steamy hot sake fulfills the Japanese side of the deal, the Red Inca and mezcal cocktails add a sufficiently Peruvian counterbalance. The Kiwis in Auckland love all kinds of sport, but ultimately it all comes down to rugby. Rugby, rugby, rugby. The violent game has become part of the national identity in New Zealand, drawing more spectators than any other sport in the country. The All Blacks dominate global rugby and you can watch them play in Eden Park, situated in central Auckland. The stadium is the largest in New Zealand, located only 3 km from the city centre and wedged between the neighbourhoods of Kingsland and Mount Eden. Along with rugby union, the stadium is also a major location for cricket in the summer. Eden Park is full of history, having been founded in 1900, and it has a mighty capacity of 50,000. Meanwhile, the nearby Mt Smart Stadium is home to Auckland’s athletics and football scene. There’s more than just one single area in Auckland that’s great for nightlife. The city is extremely popular with backpackers, so this has developed huge demand for clubs and bars in Ponsonby, while the slightly older crowds head for the scene in Parnell. The city centre normally acts as a happy medium between the two extremes. Everyone is catered for by Auckland’s nightlife, from quiet pubs and folk gigs to loud bars and high-octane nightclubs. MoveHub have picked a trio of superb places in Auckland. Impala is probably one of Auckland’s most complete nightclubs. It regularly secures big DJ acts, boasts a seriously high-quality sound system and serves a wide variety of craft beer and cocktails. The location is unique too, with the club situated in the basement of a former Southern Insurance building. It sounds dull, but you’ll look twice at the steel safe door in the bathroom and the spiral steps leading up to the ground level. Revellers have the choice of two lounge areas. located on either side of the DJ booth (yay symmetry), and a dance floor. When it comes to proper clubbing, Impala is one of Auckland’s best offerings. This bar has a childlike enthusiasm for aeroplanes, and the evidence is everywhere. The name is already a strong indication, but once you step in there you’re greeted with a ludicrous amount of plane-based paraphernalia. It feels like stepping back in time, what with the traditional leather suitcases, old-fashioned airline seats and colourful plane cartoons everywhere. The coolest thing here though is the Craft Beer Passport, which lets you taste 30 of the bar’s top craft beers. There’s a lot of live music here too, such as the Kingsland Folk Club on sundays and a lovely courtyard out the back. Oh, but you’ll have to find another plane-themed bar on Mondays, as that’s when Flight 605 is closed. Amazing views are a common theme in Auckland, so it’s only right that the city should have a club looking across Waitemata Harbour. Seven is a sleek and stylish bar that turns into a club on Friday and Saturday nights, offering a rooftop experience with world-class cocktails. There’s a Vietnamese focus to the drinks on offer, which is why you’ll find things like the Saigon Surprise and the Mekong MeGone. There’s also a cool neon vibe to the bar, complete with a magnificent light installation created by local designer Angus Muir. Fancy knowing a bit more about Auckland? Pick a book up! Auckland: Then and Now (2016) by Jenny Haworth looks at how Auckland has changed over time through a series of stunning photographs. South West of Eden: A Memoir (2010) by C. K. Stead documents the eminent New Zealand writer’s early life in Auckland, from Cornwall Park to Takapuna Beach.